Australia portable fence is made of carbon steel wire and welded or woven together to form a high strength mesh. The mesh is welded onto the steel frame and then hot dipped galvanized for a corrosive resistant surface. The Australia portable fence is combined with the fence panels, feet, clamps, stays, shade cloth and other parts. Australia portable fence is easy to install and long life, it is are used predominantly as high security barrier wher visibility through the fence is necessary and desirable. Australia portable fence has wide application, it can offer a total package for your construction sites, residences and any wher you want to use it. Australia portable fence has fence panels, clamps, feet, stays, shade cloth and other parts. Australia portable fence panels have welded portable fence and chain link portable fence. They can supply high tensile and safety for your residences, construction sites and any other places. Australia welded portable fence has standard, lightweight and heavy duty types. 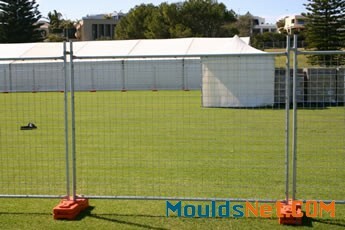 Australia chain link portable fence can offer safe to the buildings. Australia portable fence clamps have clamps for the blow mould feet and clamps for the injection mould feet. Portable fence clamps are used to secure the panel together and get rid of being blown down by the wind and human factor. The portable fence clamps have two types: clamps for the blow mould feet and clams for the injection mould feet. They are all hot dipped galvanized with 42 microns zinc coated thickness. They are combined with the clamps body and bolts and nuts. Bolts and nuts: 10mm (thickness) × 50mm (length). 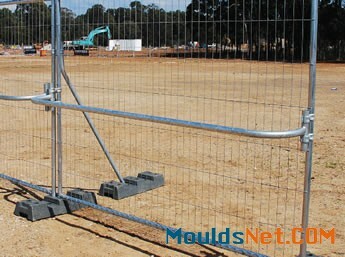 Australia portable fence feet have three main types: blow mould feet, injection mould feet and recycled rubber feet. The portable fence feet have three types: blow mould feet, injection mould feet and recycled rubber feet. They are made of flexible and durable co-polymer polypropylene or the rubber. They are UV stabilized for sun and weather protection. They have various colors for choose to make your portable fence more attractive. The main function of the feet is that fix the panel to the land and connect the neighbor fence panel. They can let the portable fence safer and protect the fence panel from cracking and chipping. Feet size: 560mm × 245mm ×130mm. Feet size: 600mm × 220mm ×150mm. Feet size: 767mm × 192mm × 126mm. Australia portable fence stays & bracings are made of steel pipe and then hot dipped galvanized with 42 microns zinc thickness. They are specially designed for extra strength and stability. The stays & bracing are used to support the portable fence in high wind area. They can assure the portable fence stand in the high winds and supply the extra safe for the building and sites. Commonly, the portable fence stays & bracing is installed on the fence panel combined with the clamps and fence feet. There may need two clamps and three plastic feet. 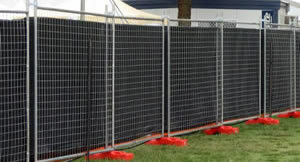 Australia portable fence shade cloth can supply the privacy and security for the sites. The Australia portable fence shade cloth can be attached to the portable fence for providing the greater privacy and security for the construction site and residences. The shade cloth can be used to minimize dust blowing off the site and prevent people from looking into the site. It can provide 70% block out. The color of the shade cloth can be green, black, white and other colors are available. The shade cloth also can be printed the advertisement. It can make the portable fence more attractive and can play the role of publicity board. The Australia portable fence also has other accessories, hand rails, dog bars and other accessories. You can choose them according to your requirements. Hand rails can be attached to the portable fence to provide extra pedestrian protection and stop passers by from tripping over the protruding feet. It can also supply the convenience for the old man and disabilities. Dog bars are designed for the portable fence to create an enclosure that ensures that the animals are safety and securely contained. They can prevent the animals from getting into and our of the portable fence. The Australia portable fence dog bars can also prevent the balls from going underneath it if children are playing in the area. Australia portable fence hand rails can supply the extra pedestrian protection. Australia portable fence dog bars can prevent animals from entering or exiting the fence. Easy to install and remove. It can be installed by one person. Movable. the flexible feet let the fence can be moved to any wher. Different types for choice. Welded portable fence and chain link portable fence. Various accessories can be supply to satisfy the different requirements of customers. Corrosion and rust resistance. The hot dipped galvanized zinc coated can be 400g/m2, it can supply an corrosive resistance surface for the portable fence. Cost effective. The portable fence can be thousands of cycles, and the practicability is worthy of the cost. The Australia portable fence can supply the security, so it is widely used in the daily life. 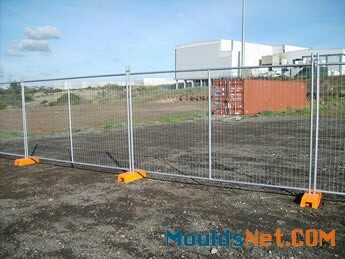 Australia portable fence can be used in the construction sites for the protection of the workers and machines. It can be installed in the residential housing sites. Australia portable fence has the movable features, so it can be used in the public events, sports, festival and other events. 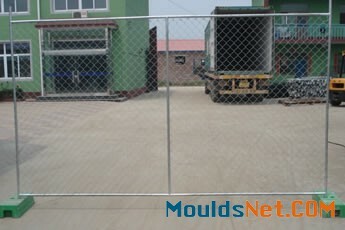 Australia portable fence can supply the security for the factory and construction sites. Australia portable fence shade cloth can minimize dust blowing off the site.